At a meeting with OPEC, APEM and Blackburn with Darwen Borough Council last week, we discussed how the litter trap should be modified to make it more effective in high flows. There will always be times when the boom cannot perform effectively when the river is in high flow but we intend that it will be working for as much of the time as possible to minimise the impact of litter downstream. Other alterations are also being explored to ease access for emptying and increase safety. These include bracing the basket to strengthen it, adding eyelets to the basket so that it can be stabilised during lifting and strengthening the lifting bars. 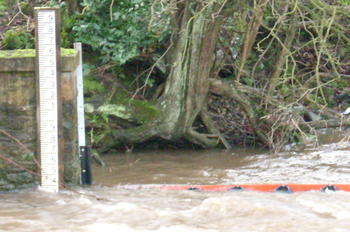 On 21st January 2008 the River Darwen was at its highest ever recorded (since 1976)! The boom survived, which shows that it is capable of the force of water in the river. We were lucky that nothing big was caught in the flood as this extra pressure could have broken it! The boom modifications to the sliding device made on 29th October 2007 have not enabled the boom to move up and down with the river level. OPEC is looking into the possibility of using a different (roller based) runner to ease boom movement, which could widen the operating conditions for the trap. We are also considering adapting the runner to bend over in an arc, aiding release at the top of the runner.